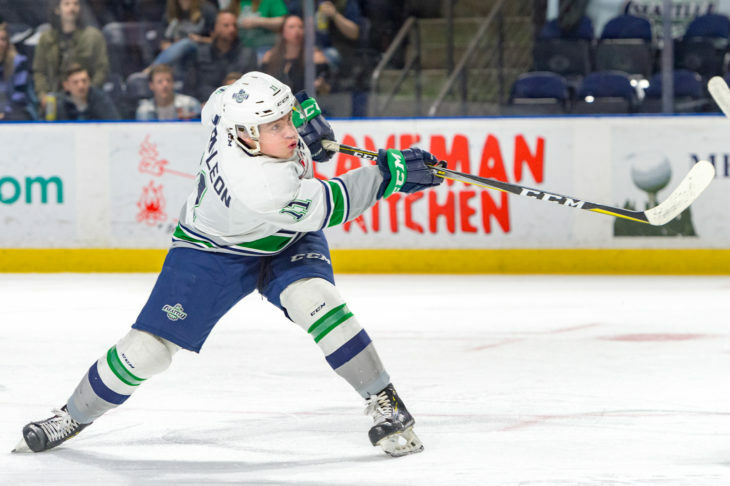 KENT, March 27, 2019 — The Seattle Thunderbirds came back from a three-goal deficit Wednesday night at accesso ShoWare Center by scoring four unanswered goals, capped off by Matthew Wedman’s game winner at 15:46 of the third period, to secure a 4-3 Game 4 victory over the Vancouver Giants. The first round playoff series between the T-Birds and Giants is tied 2-2. Game 5 is Friday at 7:30pm at the Langley Events Centre. Game 6 is Saturday at 6:05pm at accesso ShoWare Center. 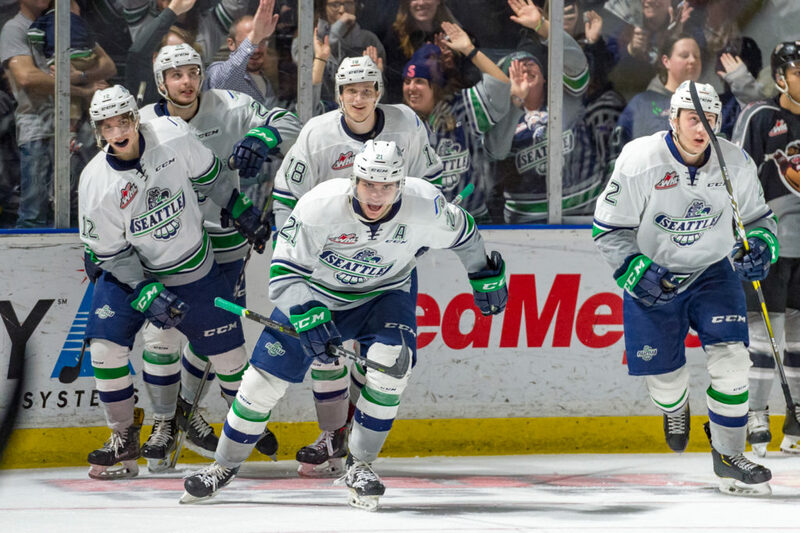 Single game tickets for Game 6 are on sale online on the T-Birds website and at the accesso ShoWare Center box office. Vancouver went in front 1-0 at 10:33 of the first period on a goal from Dylan Plouffe. The Giants took a 2-0 lead with three minutes left in the first on a goal from Brayden Watts. Vancouver made it a 3-0 lead at 2:19 of the second period on a goal from Davis Koch. Keltie Jeri-Leon scored the T-Birds first goal in the 4-3 win in Game 4. Seattle started the comeback at 5:18 of the second on the power play. Nolan Volcan carried the puck up the right wing the rush. Volcan took a shot from the right circle that was blocked and went behind the net. Keltie Jeri-Leon got the loose puck and skated out into the left circle and then the slot. Jeri-Leon beat Vancouver goalie David Tendeck with a wrist shot over the blocker. 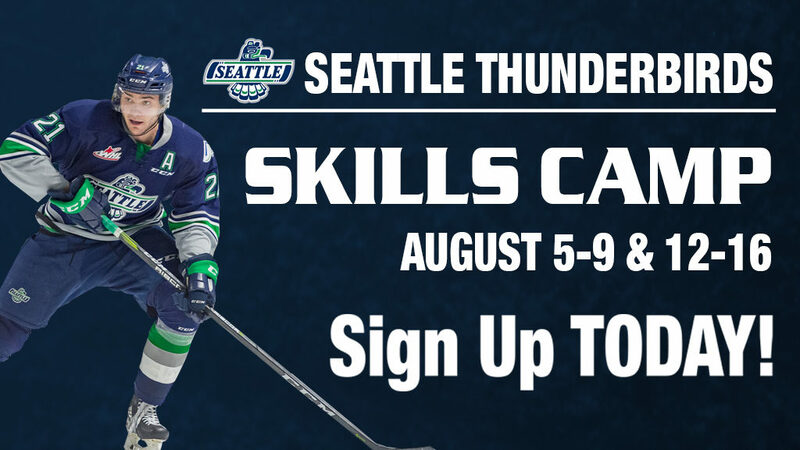 Noah Philp pulled the T-Birds to within one goal at 7:11 of the second period. Philp entered the offensive zone on the left wing and centered to Andrej Kukuca. Kukuca sent the puck right back to Philp in the left circle. Philp beat Tendeck with a wrist shot for his first goal of the playoffs. Kukuca tied the game 3-3 at 11:13 of the third on the power play. Philp had the puck on the right wing with Wedman in front of Tendeck. Philp passed the puck to Wedman who tipped the puck on goal. The rebound came to Kukuca in the left circle and he beat Tendeck with a quick slap shot. Seattle goalie Roddy Ross making one of his 26 saves in Game 4. Wedman scored the game-winning goal at 15:46 of the third. Henrik Rybinski stole the puck on a backcheck in the right circle. Rybinski went behind the Vancouver net and centered the puck to Wedman on top of the crease. Wedman beat Tendeck low on the blocker side. Vancouver pulled Tendeck with 1:10 left in the game for an extra attacker. Seattle goalie Roddy Ross stopped Milos Roman in close all alone with a big save with a minute left. Tyler Carpendale blocked two shots and Simon Kubicek did hard work in the left corner killing time by tying up the puck. First period – 1, Vancouver, Plouffe 3 (Koch, Svejkovsky), 10:33. 2,Vancouver, Watts 2 (Dmytriw, Bafaro), 17:00. Penalties – Richards, Sea (major-checking from behind, game misconduct), 4:16. Plouffe, Van (roughing), 15:45. Kubicek, Sea (interference), 15:45. 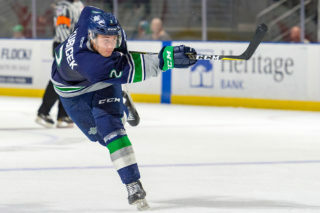 Second period – 3, Vancouver, Koch 1 (Nielsen, Kannok Leipert), 2:19. 4, Seattle, Jeri-Leon 1 (Volcan), 5:18 (pp). Penalties – Roman, Van (hooking), 3:30. Philp, Sea (delay of game), 7:01. Hardy, Van (checking to the head), 11:58. Third period – 5, Seattle, Philp 1 (Kukuca, Tyszka), 7:11. 6, Seattle, Kukuca 3 (Wedman, Philp), 11:13 (pp). 7, Seattle, Wedman 2 (Rybinski), 15:46. Penalties – Byram, Van (tripping), 5:04. Kannok Leipert, Van (cross checking), 10:54. 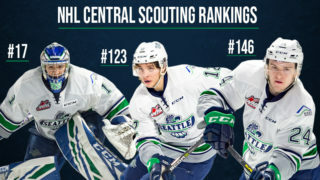 Shots on goal – Seattle 9-13-12 34, Vancouver 12-11-6 29. 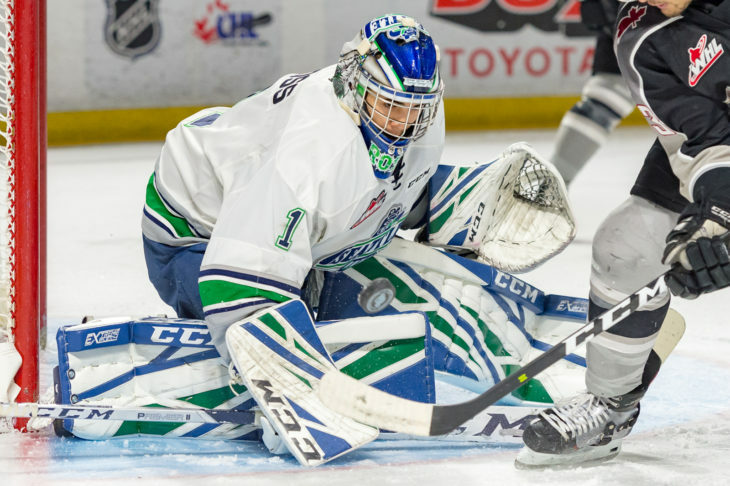 Goalies – Seattle, Ross 29 shots-26 saves (2-2); Vancouver, Tendeck 34-30 (1-1). 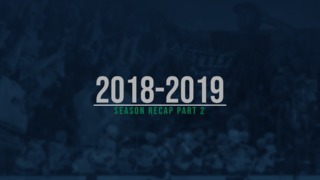 Power plays – Seattle 2-4; Vancouver 0-2. A – 2,270. Referees – Jeff Ingram, Mark Pearce. Linesmen – Ron Dietterle, Mark Heier.